This hinged opening fire escape is a single pane of walk-on glass installed completely flush with the surrounding terrace/garden. The only hint of its opening ability is a small 20mm wide joint all round. There is no obvious framing from above or below. This is to maintain the sleekest possible aesthetic. When it pivots up to fully open, the hole lets maximum light and ventilation down into the pool room via the stone staircase. The glass itself also acts as the balustrade required to provide an escape route in the event of an emergency. As the opening panel is officially a fire escape route from the basement, the entire automation system is battery powered and will open in approximately 25 seconds. The opening command could have been linked to the fire alarm so that its opening would be automatic. However, with false alarms issues the client felt this would be over-complex, so it is operated by wall switch plate. As a further back up to the mains-recharged battery power supply, there is a hand pump to allow opening or closing of the 750kg roof-floor in the event of an automation system failure. The mechanism is driven by powerful hydraulic rams fitted discreetly near the hinges for clear views. They allow ready pedestrian access without the risk of tripping which could result from a longer ram at the hinge. When closing, there is a safety beam to prevent people or objects from becoming trapped by the moving panel. Installation was complicated by a steep staircase round the house to the lower rear garden level. A HIAB truck delivered the framing for the installation and then lifted a crawler crane down to the lower level. This then lifted the frames and glazing separately in a number of hops onto the waiting upstand. 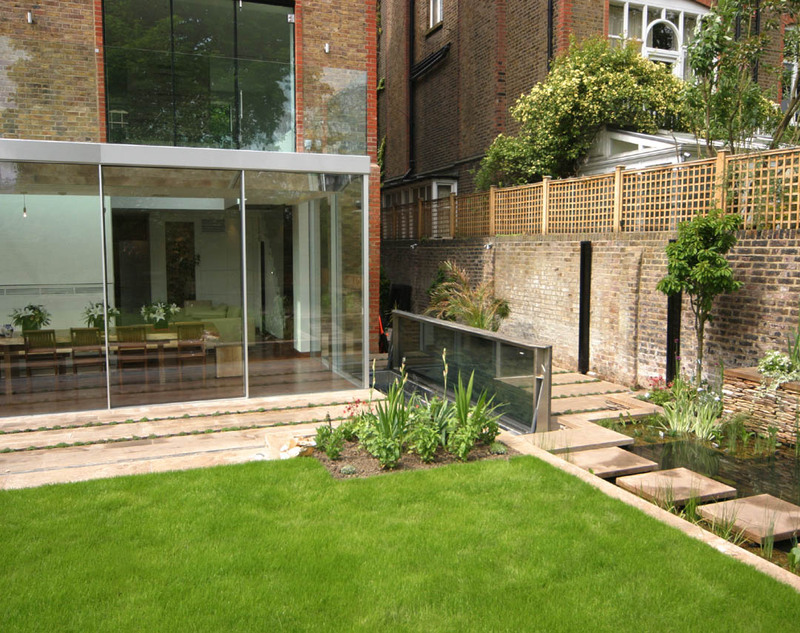 A hinged glass walk-on panel provides daylight to and fire escape route from a basement pool area. 4.6m by 1m.